The Chilling Role of Epidemic Levels of Gender Based Violence – in Undermining African & Global Development Goals on Girl Child Education; HIV, Reproductive, Sexual, Maternal & Child Health; Women’s Economic Empowerment; & Political Representation. 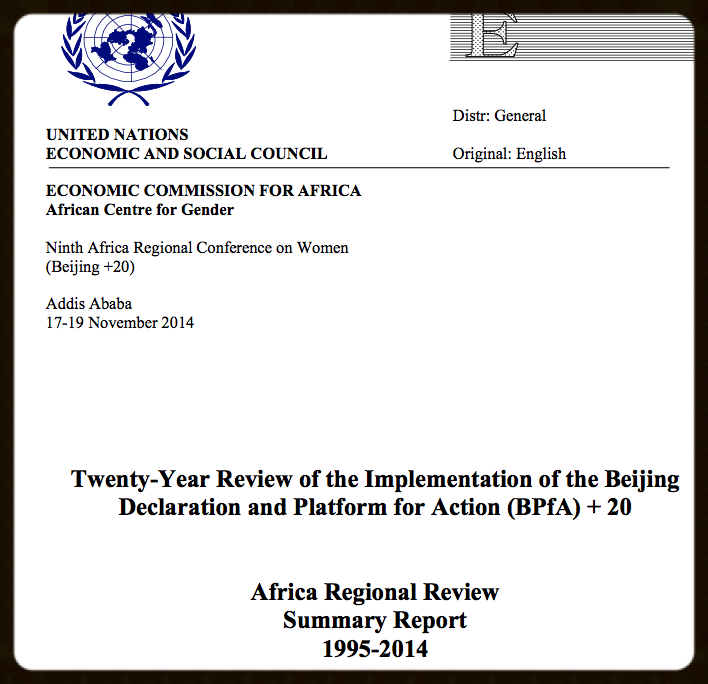 Heads of State & Governments Called on to Establish / Strengthen Independent National Gender & Equality Commissions in 2015 in All Countries (as Key Action of “AU Year of Women’s Empowerment”) – with Mandate for Full Multisectoral Domestication of AU Protocol to the African Charter on Rights of Women – in Force Since 2005 – But Not Implemented. 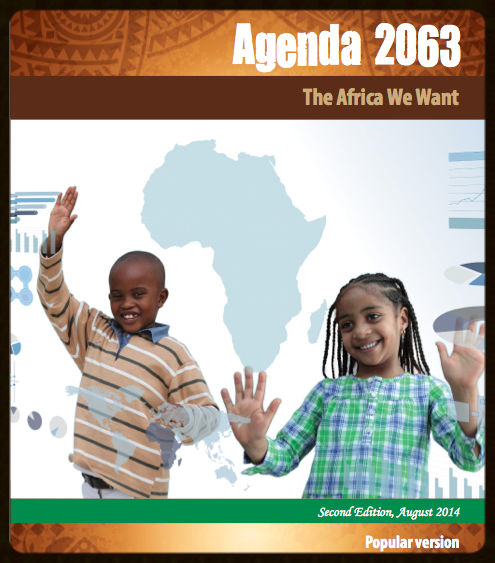 Call for AU Africa 2063 Agenda; Global Post 2015 Development Goals & Outcomes of Beijing+20 Review – to Include Trackable Programatic Commitments, Goals & Targets – with Legislative & Budget Support – to Eradicate Epidemic Levels of Violence Against Girls & Women. Call for Establishment of Independent Global Gender Equality Commission – of Eminent Persons, Experts & Campaigners – With Mandate to Report on Bi-Annual Progress on Gender Based Violence & Discrimination. Editorial, Summary Findings & Recommendations From Scorecard & Factsheet. Epidemic levels of violence against girls and women – the most blatant, brutal, unambiguous and dis-empowering manifestation of gender inequality – has not been eradicated – but rather is institutionalised, and profoundly entrenched across Africa. The joint top ten African countries (13 in all) with the highest percentage of MALES 15 to 49 years of age justifying gender based violence are: Central African Republic 75%; Guinea 66%; Congo 62%; Equatorial Guinea 52%; Zambia 49%; Lesotho 48%; Madagascar 46%; Ethiopia 45%; Eritrea 45%; Burundi 44%; Kenya 44%; Uganda 44%; and Cote d’Ivore 42%. 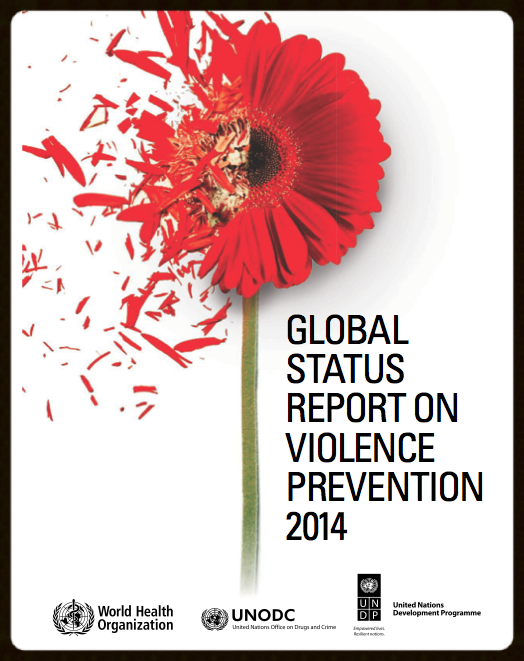 Significantly in 4 of these countries over 50% of MALES 15 to 49 years of age justify gender-based violence. In a deeply worrying sign for the future – current data underlines that violence against women and girls – is now as deeply ingrained amongst African ADOLESCENT BOYS, as it is in adult men. When the data is restricted to ADOLESCENT BOYS (15 to 19 years old) – the number of countries double to 8 – i.e. 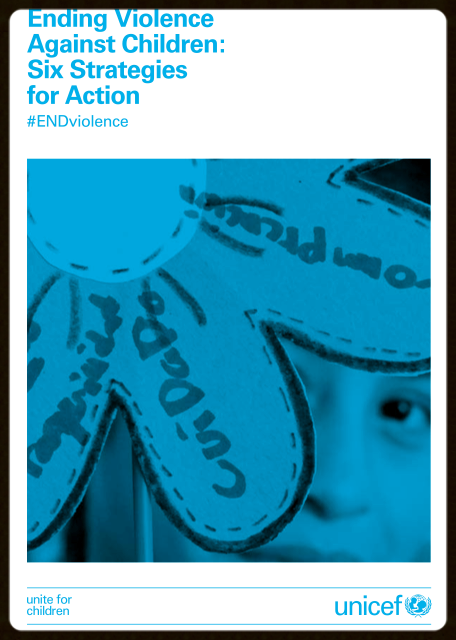 African countries where over half of ADOLESCENT BOYS 50% or more justify gender based violence: Central African Republic 87%; Burundi 56%; Zambia 55%; Kenya 54%; Lesotho 54%; Uganda 52%; Cote d’Ivore 51%; and Ethiopia 51%. Even more disturbingly for gender equality, women’s health, human security and development – higher percentages of African girls and women have been negatively socialised and indoctrinated to accept and justify violence against themselves as normal and acceptable. From the countries for which data is available over a quarter – between 25% and 92% of GIRLS and WOMEN 15 to 49 years old – in an astonishing 42 African countries – i.e. 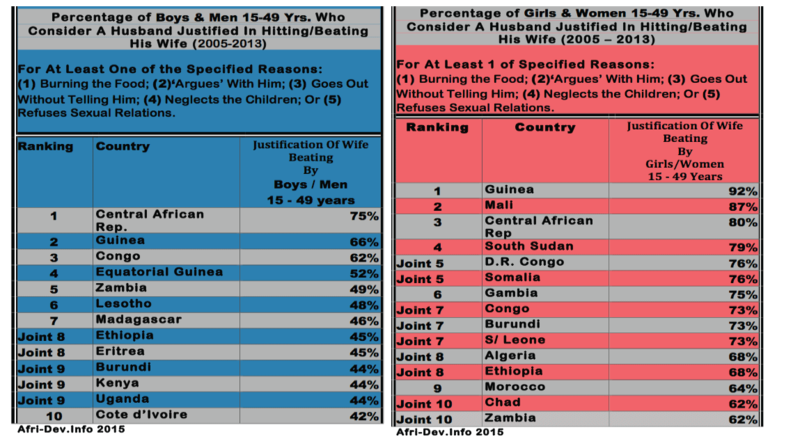 17 more countries than boys and men of the same age category – now believe that it is justifiable for men to beat their wives for the reasons outlined above. The institutionalised indoctrination and negative socialisation of millions of African girls and women to accept violence against themselves as normal – significantly driven by wide spread – state sanctioned or state tolerated – abuse and exploitation of minors – through underage and forced ‘marriages’ amongst other reasons – represents great danger to gender equality; women’s citizenship, constitutional and human rights; and to Africa’s wider and long term sustainable development. 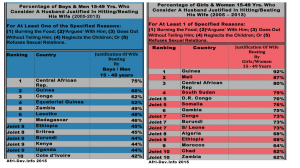 In comparison to the fewer number of 8 countries in the same category for BOYS AND MEN aged 15 to 49 years – there are 25 African countries where over half of GIRLS and WOMEN – 15 to 49 years old (50% or more) have been brutally socialised to justify gender based violence – i.e 17 more countries than with boys and men of the same age group: Guinea 92%; Mali 87%; Central African Republic 80%; South Sudan 79%; D.R. Congo 76%; Somalia 76%; Gambia 75%; Congo 73%; Burundi 73%; Sierra Leone 73%; Algeria 68%; Ethiopia 68%; Morocco 64%; Chad 62%; Zambia 62%; Niger 60%; Senegal 60%; Liberia 59%; Uganda 58%; Rwanda 56%; Tanzania 54%; Kenya 53%; Equatorial Guinea 53%; Eritrea 51%; and Gabon 50%. Guinea at 92% even manages to surpass Afghanistan at 90% – as a country where almost all girls and women 15 to 49 years old accept Gender Based Violence as normal. With ADOLESCENT GIRLS 15 to 19 years old – the data is even more chilling. From the countries for which data is available well over a quarter – between 25% and 83% of ADOLESCENT GIRLS 15 to 19 years old – in 41 African countries – believe that it is justifiable for men to beat their wives for the reasons outlined above. More significantly – in more than half of Africa’s 55 countries – 28 countries in total – over half of ADOLESCENT GIRLS (50% or more) have been brutalised, and negatively socialised to justify gender based violence for the reasons outlined above: Mali 83%; Central African Republic 79%; Guinea 79%; Congo 76%; Somalia 75%; Burundi 74%; Gambia 74%; D.R. Congo 72%; South Sudan 72%; Eritrea 70%; Niger 68%; Algeria 66%; Ethiopia 64%; Morocco 64%; Sierra Leone 63%; Uganda 62%; Senegal 61%; Zambia 61%; Chad 59%; Gabon 58%; Kenya 57%; Rwanda 56%; Ghana 53%; Sudan 52%; Tanzania 52%; Cote d’Ivoire 51%; Cameroon 50%; and Egypt 50%. In all 45 countries for which data is available in this category, the lowest percentage of ADOLESCENT GIRLS that now justify gender based violence is 16% (in Malawi). The failure of majority of African governments to uphold citizenship rights, human security and human development of girls and women – leaving them exposed to epidemic levels of institutionalized gender based violence is undermining African and global development goals for Girl Child Education; HIV, Reproductive, Sexual, Maternal – and Child – Health, Cervical Cancer, and Mental Health of Women amongst other health issues – and undermining Women’s Economic Empowerment, Political Representation, and overall Poverty Reduction. Painfully this is not a sudden problem – UNICEF, UNFPA, UN Women, UNAIDS, the World Health Organisation – and a wide range of gender equality, womens rights organisations and civil society amongst others have at different times drawn attention to violence against girls and women globally, and in Africa. But the time for diplomatic speak is past. We cannot wait until 99% of boys and men, girls and women – in 99% of African countries justify or accept gender based violence as normal – before we declare an emergency. 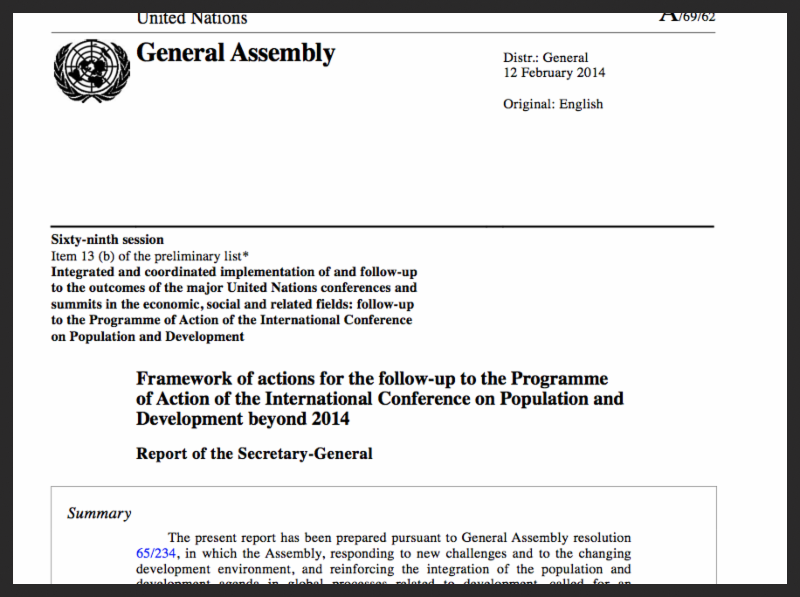 We caution that if this trend continues – It is unlikely any of the new global or African Sustainable Development Goals will be sustainably achieved if African governments fail to uphold – the basic freedom of women and girls to be free from violence, for bodily integrity – freedom of expression, association, and movement amongst other fundamental rights. 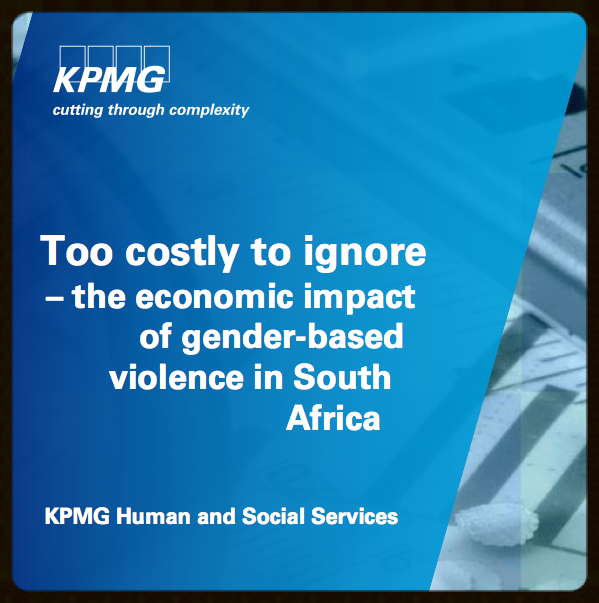 Everyday gender based violence in homes and communities – now affecting millions of women daily is a arguably now a far greater problem than even gender based violence in conflict. Indeed sexual violence against girls and women in conflict as witnessed in the Democratic Republic of Congo, or the abduction of nearly 300 #ChibokGirls by Boko Haram in Nigeria (which gleefully announced their sale into ‘marriage’) – are manifestation’s of the epidemic normalisation of gender based violence in Africa. There is a hollow ring to celebration of unimplemented conference declarations while millions of girls and women are routinely abused, exploited, beaten, and subjected to servitude in homes and communities across Africa – without recourse to justice. Governments have to act on law enforcement, and constitutional responsibility to protect women and girls from all forms of violence and discrimination. 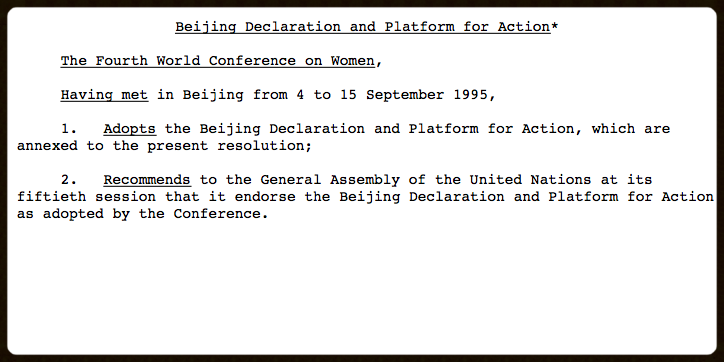 Importantly, the 2015 Commemorations of 16 Days of Activism To End Violence Against Women And Girls – needs to go beyond seminars, workshops and internet chats – and mobilse women organised in professional associations, trade unions and community groups; side by side with – adolescent girls, urban poor, rural women and girls – and underage girls forced into ‘marriage’ – the latter more likely to suffer violence without redress. They must know, they are not alone. ______________________________________________ Below are: • Recommendations from Scorecard & Factsheet. 2. Supportive Reduction to Zero – of Percentage of Girls & Women Negatively Socialised & Indoctrinated to Justify/Accept Gender Based Violence as Normal through: – Improved investment in girl child / women’s formal education; – Ensuring equitable policy and investment for girls and women’s right to health; – Improved government and private sector investment in women’s economic empowerment; – Ensuring gender equitable political representation at all levels of governance (including where necessary transitional 50/50 quota systems to ensure a more level playing field); – Legislative and budget support at all governance levels for establishment of specific national and community based emergency reporting phone numbers, safe houses, and law enforcement protection – aimed at protecting especially girl children from abuse, exploitation and negative cultural practices – especially forced and underage ‘marriages’. Cross Cutting (Male & Female) Gender Equality Awareness and Education – for boys and men; girl and women – through schools curriculum; national and local governments awareness campaigns in workplace and community; private sector Corporate Social Responsibility (CSR) / Professional Associations and Trade Union programs at work places; and through mass media / social media. 3. 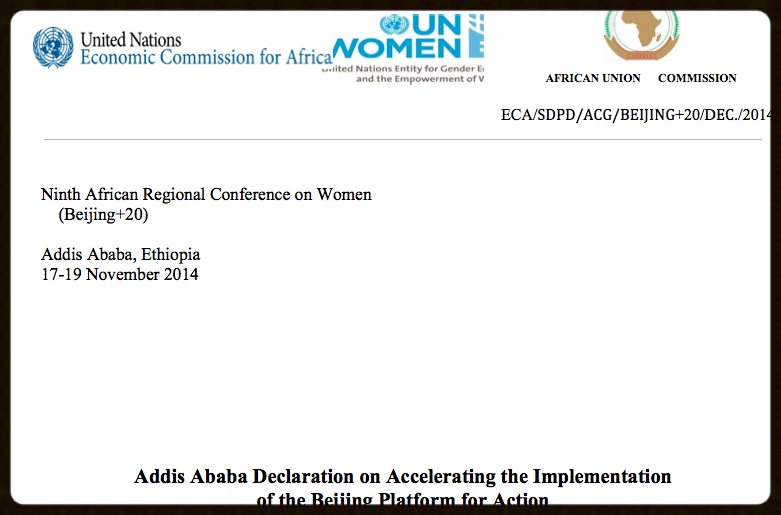 Establishment / Strengthening of Independent National Gender Equality & Women’s Rights Commissions – for Multisectoral Domestication / Implementation of Protocol to the African Charter On the Rights of Women In Africa – in force since 2005 – and currently signed and ratified by 36 African countries; and other related conventions. – Gender Equality and Womens Rights Commissions must be inclusive of full participation and representation of independent women’s organisations – and with enabling legislation and budgets to monitor, investigate, educate, promote, protect, report and rectify policy and practice undermining gender equality in government, private sector, and the community. 4. 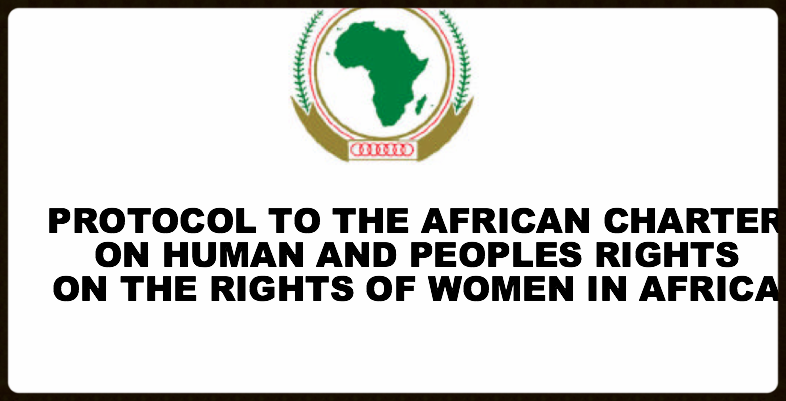 Establishment of a Special Africa / Global Independent Commission for Promotion of Girls & Women’s Human Security & Development; Gender Equality & Women’s Rights. – Composed of eminent persons, experts and campaigners – with power to issue independent annual or bi-annual reports to be presented to AU Summits; and with actionable recommendations implemented through Ministers of Justice, Gender, Youth, Education, Health, and Economic Development; and Parliaments. 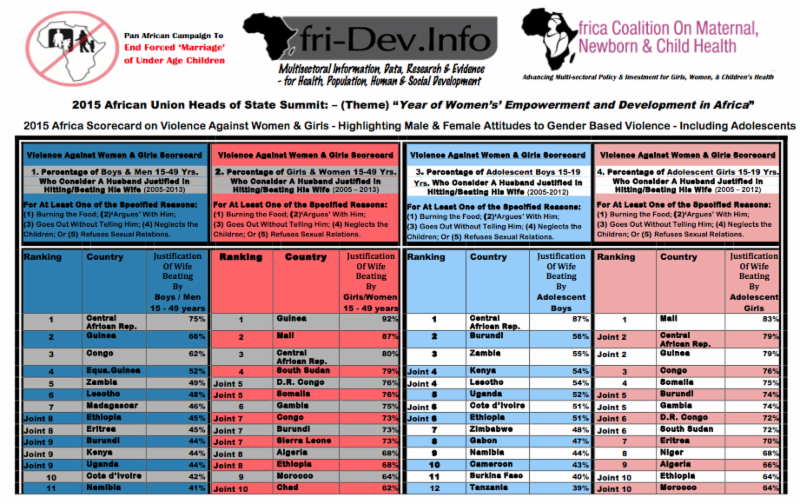 Factsheet & Scorecard Research, Analysis, & Design By Africa Health, Human & Social Development Information Service (Afri-Dev. Info); & Afri-Dev Parliamentary Support Network; With Africa Coalition On Maternal Newborn & Child Health . © 2015. Kindly Acknowledge / Cite As Used.